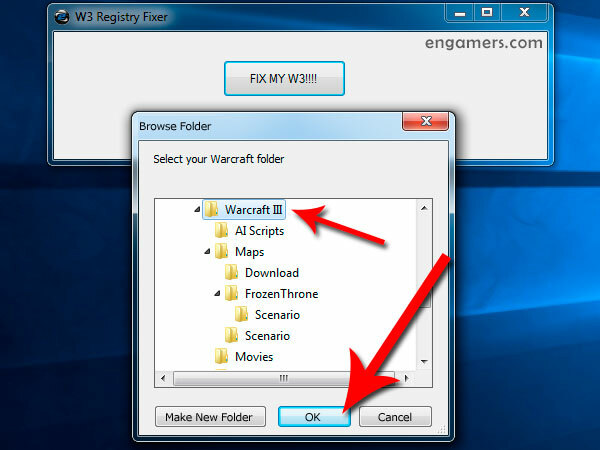 Warcraft III Fixer is a tool with which you can fix your registry of Warcraft III and solve some problems that presented during the installation of patches (Registry error loading key… RESULT: Prepatch failed) and updates. 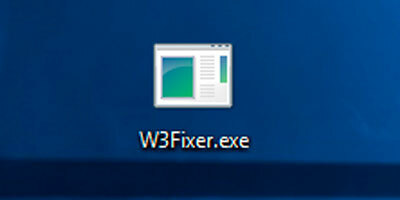 – W3 Fixer will display a message when the warcraft III registry has been successfully repaired. 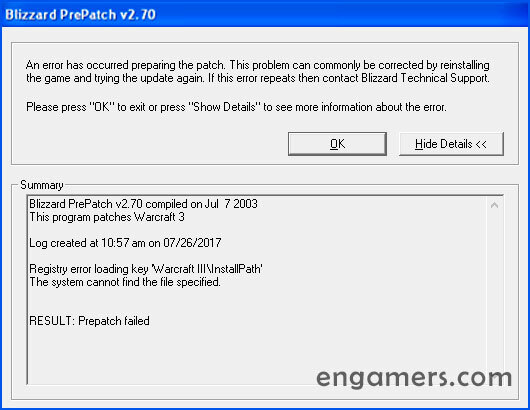 – Finally, now you can install the warcraft III patches you need: 1.26a, 1.27a or 1.27b. – ERROR: Application ERROR: The application failed to initialize properly (0xc0000135). Click on OK to terminate the application. Solution: Windows will display this error message if you try to run any application that requires “.NET Framework” execution (W3Fixer.exe), but your computer does not have it installed. To fix it, simply download and install the .NET Framework. This works perfect fine with Win7-32bit, really helpful, thanks alot. Its still trying to find an original cd…dammit how do i freaking fix this sir? This is great! It repaired my Warcraft RoC and now I can install TFT! It works great. It takes two seconds and now my W3 is fixed. Thanks alot! Hi sir, this is a nice tool that I run but I’m worried about this detection from virustotal.com. I have DirectX11 installed and my EVGA GTX 560 video card has its drivers up to date. I initially had the CD-ROM in the drive, but I uninstalled it and downloaded the game client off of battle.net, hoping that would fix the problem. Unfortunately, the problem persisted. I have installed it in compatibility mode with Windows XP SP2 and I have also tried running it in compatibility mode with Windows XP SP2 and SP3, and Windows 2000. I’ve also checked dxdiag and it tells me that there are no errors and I cannot disable or enable Direct3D like some answers I have found online. I have no idea why this game isn’t working and I’m hoping you guys could help me. Can I really not play Warcraft III, or is there a solution to this? Im using Windows 7 through bootcamp on my late 2013 [email protected] iMac. I followed a few suggestions from other forums and tried your link to fix the game, yet it still freezes on launch screen and stays unresponsive. (I.- Download the War3TFT_127b_English.exe file, and Run the downloaded file to install it. until now i cant play new map huhu .. it cant be the patch is not working , it doesnt show option “switch version” like “wvs.exe” as details either switch to 1.26 or 1.27a ..
maybe the path 1.27b is broken huhuhu … please help us fix this and show the best step for us as a guidance to install it again ,, please response as soon as possible and reply me through email please , will appreciate your attention sir ..